I, like you, have cursed Tom Brady’s name more than once. But you know what? I can’t hate him. I’m happy he’s playing in the Super Bowl. Again. I like watching greatness, and, with all due respect to Peyton Manning and John Elway, Tom Terrific is the greatest. At some point, you’ve just got to tip your cap to the man. Don’t hate; appreciate. Besides, did you really want to watch the Blake Bortles–Nick Foles Bowl? Not I, thank you. With Brady in the Bowl, no matter what, you’ll have a rooting interest. You’ll either want to see him lose so badly you’ll be the biggest Eagles fan this side of the Liberty Bell. Or, if you’re like me, you’ll want to see him win and slip on that sixth Super Bowl ring. That would be two more rings than any other quarterback; it’s his eighth start in America’s biggest sporting event (Elway, who is second on the list to Brady, has five). Six championships is as many as Michael Jordan. Was Jordan disliked by any city as much as Denver hates Tom Brady? After his comeback win in Sunday’s AFC Championship Game, Brady has 53 game-winning drives (second only to Peyton Manning who has 56, two spots ahead of Elway, who has 46), and 42 fourth-quarter comeback wins (again, second only to Manning, who has 45; Elway is fifth with 35). Are there cities in America that hate Manning or Elway as much as we hate Brady? Nobody hates Manning. Cleveland might hate Elway, maybe Oakland and L.A. (if you combined them). At Denver Nuggets home games, when the opposition is on the free throw line at a critical moment, the jumbotron shows a picture of Brady. The crowd boos as if Uggs himself was taking the shot. It works every time. What is it with us and Brady anyway? It’s not like he’s gotten the best of Denver, not like Elway owned Cleveland. In fact, in the regular season, Brady is just 7-6 against the Broncos. In the playoffs, he’s only 1-3. If anyone has been Brady’s bugaboo, it’s us. Do you hate Brady enough to boo him in orange? A few weeks back, there were rumblings that this might be the end of the line for Brady in New England. There was also some speculation that none other than Denver could be a great landing place for Brady, who’s hell-bent on playing until he drops. I’d take him. In a heartbeat. Think about it. The only real way that Brady can improve his own legacy is to win a Super Bowl elsewhere, without a coach named Bill Belichick. Why not Denver? It worked pretty well for Manning, who made it to two more Super Bowls, winning his second and riding off into the sunset — just like Elway. Brady is going to be considered the best (by most folks who are objective, anyway) no matter what. But if he could do what Manning did — take another franchise to a Super Bowl — he would cement his status as the GOAT like no other player in football history. Denver still has a defense that could help any quarterback to the Super Bowl, especially if that quarterback was named Brady. And in a weird kind of way, perhaps Vance Joseph could be the perfect “coach” for Brady, who would essentially and appropriately run the team (see Manning and John Fox). 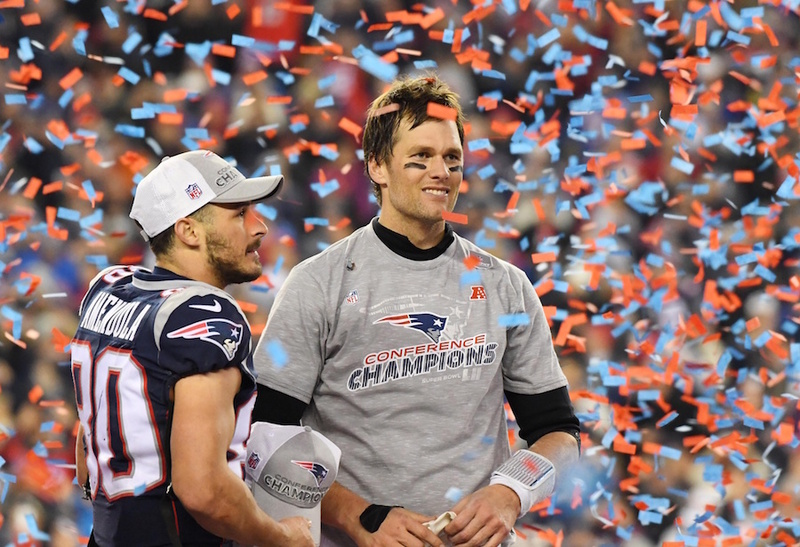 Winning here would not only add to the legend of Brady, it would also add to the belief that Denver is a place where aging quarterbacks go to win another title. That wouldn’t be a bad reputation to have, would it? Brady is going to win another championship. That will happen in two weeks. But will he remain a Patriot forever? Brady, Belichick and owner Robert Kraft would have us believe that all the talk is just that — talk. They’re saying all the right things, for now. But in the midst of another title run, what else would they say? I’m hoping Brady and Belichick win another, shake hands and part ways. And that John Elway is Brady’s first call when the dust settles. Don’t hate great. In fact, hope that he’s a Bronco next season.